Pemphigus vulgaris (PV) is characterized by intraepithelial blister formation that results from breakdown of the cellular adhesion between epithelial cells. In 1964, autoantibodies against keratinocyte surfaces were described in patients with pemphigus. Clinical and experimental observation indicates that the circulating autoantibodies are pathogenic. An immunogenetic predisposition is well established. Diagnosis is based on the identification of clinical manifestations and confirmation through biopsy. Demonstration of immunoglobulins, in the spinous cell junctions by distinct immunofluorescence (IF), is often used for the final confirmation of PV., As the oral presentation of the disease is often the first indicator that can lead to the final diagnosis, it is very critical for the dental practitioner to recognize the oral lesions of PV at a sufficiently early stage to initiate further investigations and treatment. 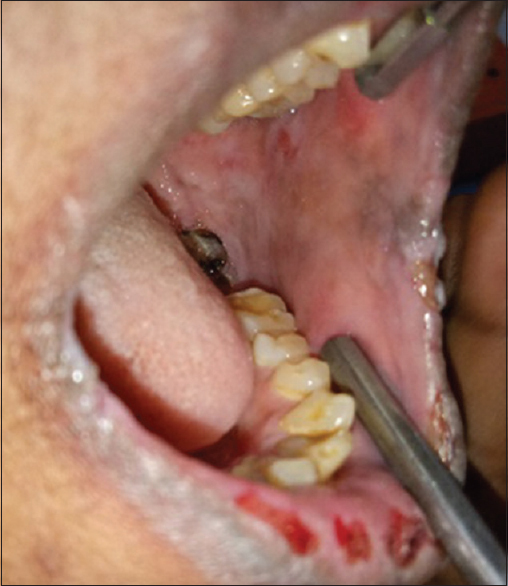 We present a case of PV where the patient presented with ulcerations at multiple oral sites including tongue, and the final diagnosis was made by the timely interpretation of these manifestations. 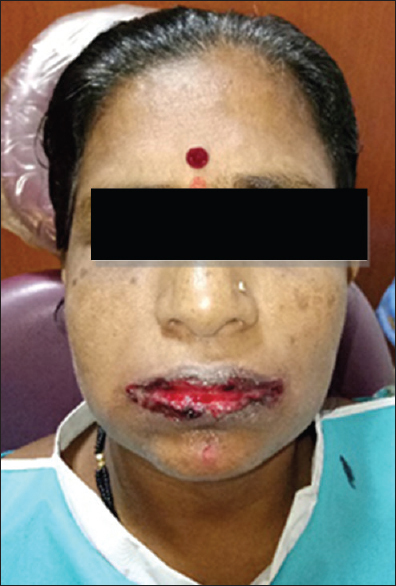 A 50-year-old woman reported to the Department of Oral Medicine and Radiology, VSDCH with a complaint of burning sensation and bleeding gums and lips for 7 months. 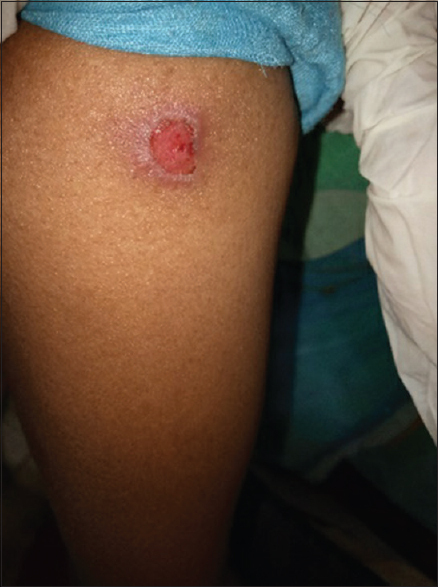 The patient reported that burning sensation occurred on intake of hot and spicy food with continuous bleeding with a history of ulcers in the skin. She had received fluconazole Once daily for a week and then discontinued the treatment. Personal and family history was uneventful. 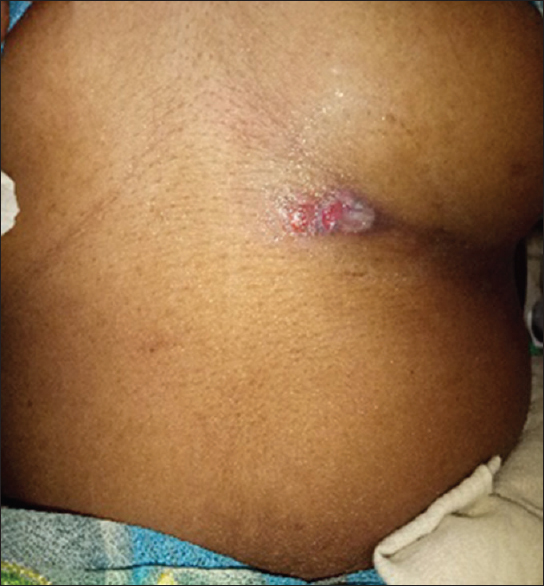 On the extraoral examination, well-defined ulcerative lesion (ruptured vesicles) was present on the symphysis, back of the neck, and upper abdomen region [Figure 1] and [Figure 2]. 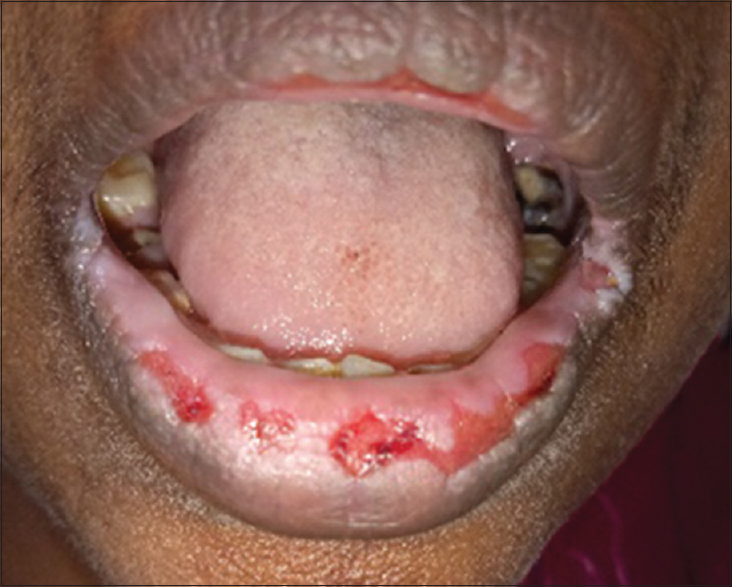 On intraoral examination, multiple ulcers with ill-defined margins, erythematous, and sloughy floor were noted on the vermillion border of the upper and lower lip, labial mucosa, buccal mucosa, hard and soft palate, dorsum surface of the tongue and the floor of the mouth [Figure 3], [Figure 4], [Figure 5], [Figure 6]. On palpation, the base of ulcer was soft tender and easily bled on touch. 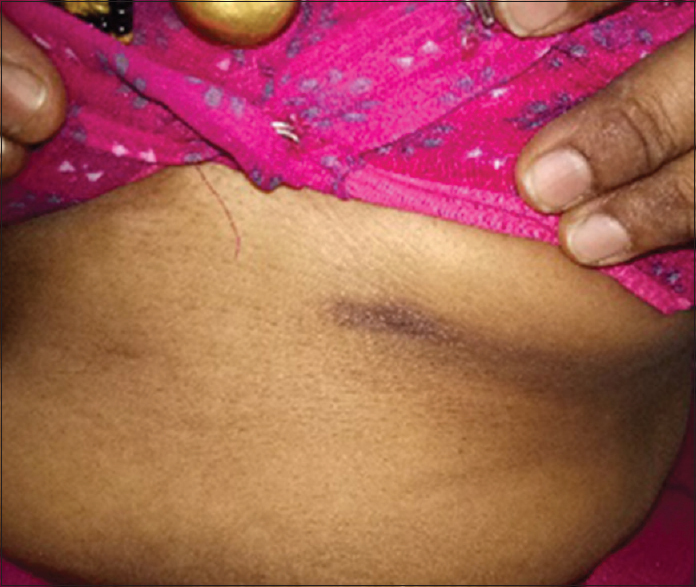 A diagnosis of PV was made after a skin biopsy, which yielded a positive Tzancktest. 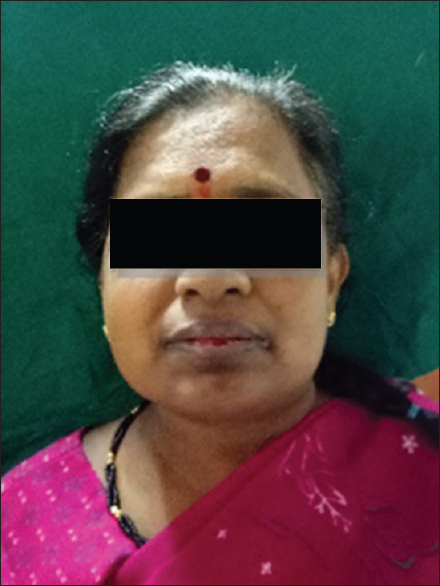 The patient was referred to the Clinical Dermatology, KIMS Hospital for treatment after the informed consent was obtained and was initially under injection Betnesol OD for 6 days, injection Taxim 1 g BD for 6 days, Tess buccal paste application OD for 6 days, Betadine mouthwash BD for 6 days, tablet fluconazole 150 OD on day 1 and day 5 and 6, tablet Omnacortil 20 mg OD on day 5 and day 6, tablet Endoxan 50 mg OD on day 5 and 6. The patient recovered and was directed for regular follow-up. 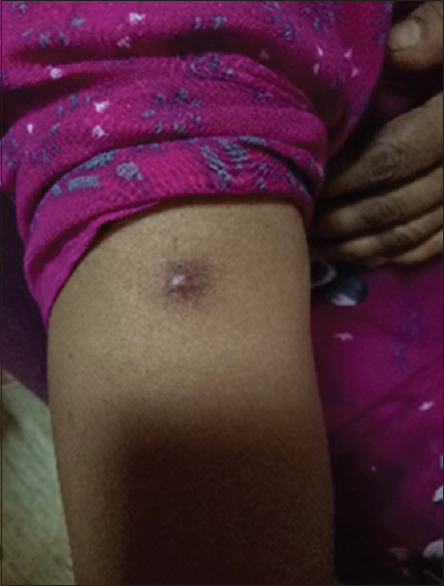 The patient was reviewed after a month, and the lesions showed healing without scarring [Figure 7], [Figure 8], [Figure 9], [Figure 10], [Figure 11], [Figure 12]. Derived from the Greek word meaning “blister,” Pemphigus is a group of potentially life-threatening autoimmune mucocutaneous disorders characterized by intraepithelial blister formation. The blisters occur in the epithelium where the patient's IgG autoantibodies produced in response to triggering factors target two structured proteins of desmosomes identified as Desmogleins 1 and 3. Recently, a new Pemphigus antigen Desmoglein 4 and other non-Desmoglein antigens such as human α-9-acetylcholine receptor that regulates keratinocyte adhesion and keratinocyte annexin such as molecules binding acetylcholine termed pemphaxin and catenin are also thought to play a role in its etiopathogenesis., Thin separation at the desmosomal region triggers the acantholysis and suprabasal spilt. Since the clinical features of PV are similar to those seen in Cicatricial Pemphigoid and Bullous Lichen Planus, its diagnosis needs to be confirmed with routine histopathology and IF studies. Tissue bits from both sites were taken in our case, and the histologic features were suggestive of PV. The diagnostic features were the presence of a suprabasilar split and acantholytic Tzanck cells in the split, both produced due to the intraepithelial blister formation. Direct IF study showed the typical “fish-net” pattern of IgG and complement C3 deposits in the spinous layer, the site for the autoimmune reaction in PV. Both histopathology and IF studies confirmed the diagnosis of PV. An important aspect of patient management is early diagnosis when lower doses of medication can be used for shorter periods of time to control the disease. Dental professionals must be sufficiently familiar with clinical manifestation of PV to ensure early diagnosis and treatment since this in turn determines the prognosis and course of the disease. The institution of early treatment could prevent serious involvement of other mucosa and cutaneous sites and fatal complications. PV is generally managed with local and systemic corticosteroid therapy. Treatment is administered in two phases: a loading phase, to control the disease, and a maintenance phase, which is further divided into consolidation and treatment tapering. Local treatment consists of a paste, an ointment or a mouthwash administered alone or in conjunction with systemic treatment. Intralesional injections of corticosteroids have been used for the management of persistent lesions. In cases of extensive oral lesions or involvement of other mucosa and skin, systemic corticosteroid therapy is initiated immediately. The initial of prednisone 0.5–2 mg/kg is recommended. Depending on the response, the dose is gradually decreased to the minimum therapeutic dose, taken once a day in the morning to minimize side effects. When steroids are used for longer periods of time, adjuvants such as azathioprine or cyclophosphamide are added to the regimen to reduce the complications of long-term corticosteroid therapy. Before the advent of corticosteroid therapy, pemphigus was fatal, with a mortality rate of up to 75% in the first year. It is still a serious disorder; however, the 5%–10% mortality rate is now primarily due to the side effects of therapy. 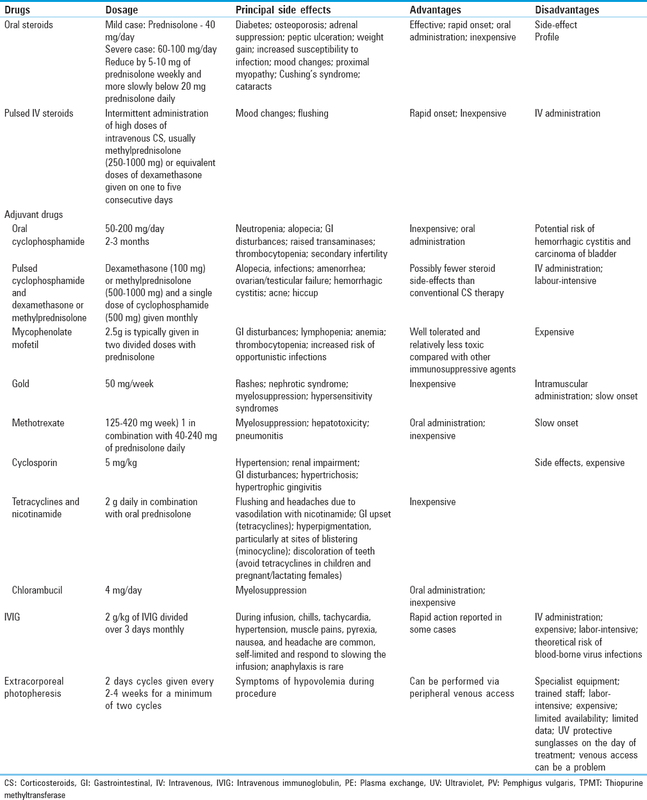 The different treatment options are summarized in [Table 1]. 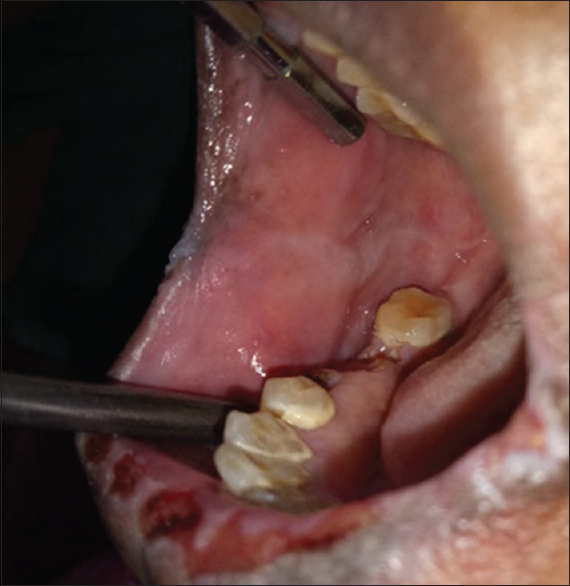 Dental professionals must be sufficiently familiar with the clinical manifestations of PV to ensure early diagnosis and treatment which in turn determines the prognosis and course of the disease. Beutner EH, Jordon RE. Demonstration of skin antibodies in sera of pemphigus vulgaris patients by indirect immunofluorescent staining. Proc Soc Exp Biol Med 1964;117:505-10. Femiano F. Pemphigus vulgaris: Recent advances in our understanding of its pathogenesis. Minerva Stomatol 2007;56:215-23. Scully C, Challacombe SJ. Pemphigus vulgaris: Update on etiopathogenesis, oral manifestations, and management. Crit Rev Oral Biol Med 2002;13:397-408. Black M, Mignogna MD, Scully C. Number II. Pemphigus vulgaris. Oral Dis 2005;11:119-30. Kljuic A, Bazzi H, Sundberg JP, Martinez-Mir A, O'Shaughnessy R, Mahoney MG, et al. Desmoglein 4 in hair follicle differentiation and epidermal adhesion: Evidence from inherited hypotrichosis and acquired pemphigus vulgaris. Cell 2003;113:249-60. Nguyen VT, Ndoye A, Grando SA. Pemphigus vulgaris antibody identifies pemphaxin. A novel keratinocyte annexin-like molecule binding acetylcholine. J Biol Chem 2000;275:29466-76. Fellner MJ, Sapadin AN. Current therapy of pemphigus vulgaris. Mt Sinai J Med 2001;68:268-78. Tóth GG, Jonkman MF. Therapy of pemphigus. Clin Dermatol 2001;19:761-7. Lever WF, Schaumburg-Lever G. Treatment of pemphigus vulgaris. Results obtained in 84 patients between 1961 and 1982. Arch Dermatol 1984;120:44-7. Harman KE, Albert S, Black MM, British Association of Dermatologists. Guidelines for the management of pemphigus vulgaris. Br J Dermatol 2003;149:926-37.